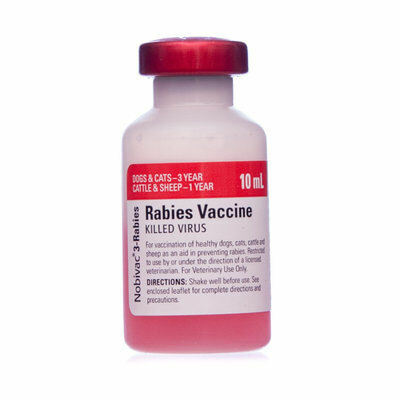 Rabies 3 Year Vaccine - $24.90/10 dose vial, Nobivac 3 Rabies labeled Only for Dogs, Cats, Sheep, Goats and Cattle - Before you order check the list of States that this vaccine can not be shipped into. Please Note: Rabies vaccines are Not For Sale into Minnesota, and also Not for Sale into the States of AK, AL, AR, CA, CT, GA, HI, IA, ID, IL, IN, KS, MD, ME, MN, MO, MS, MT, NC, NH, ND, NV, NJ, NM, NY, OR, RI, SC, TN, TX, UT, WA, WV, WY & Puerto Rico have laws prohibiting the shipment of rabies vaccines to these states. Do Not order Rabies vaccines if you live in any of these states, your order will be Voided, Refunded and Not Shipped. State laws often change so this list cannot be considered complete. Also, some state and local laws require that rabies vaccine be giving by a licensed vet and make it illegal for you to vaccinate your own animals or refuse to recognize the vaccination. Check your local laws and regulations before ordering rabies vaccine. Nobivac 3 Rabies (Merck) 3 year Rabies killed vaccine for the protection of dogs and cats against rabies . 10 Dose Vial for use in dogs and cats 3 months of age or older. Give 1ml IM or SQ. Revaccinate 1 year later, and every 3 years thereafter. Order syinges and needles separately.